Drive south from Perth stopping at Mandurah for a coffee break, the Bunbury Dolphin Discovery Centre and Busselton, home of the largest wooden jetty in the Southern Hemisphere. Browse through Vasse Virgin (formerly the Natural Olive Oil Soap Company). Experience a sunset kangaroo safari (October – May) or the sunset scenic tour (June – September). 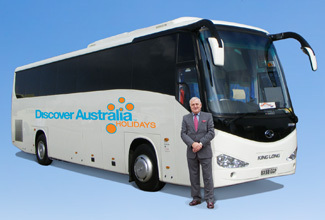 Breakfast, Luxury Coach Tour with Hotel Pick Up, Lunch, Sunset Safari, Overnight Margaret River Accommodation. Lovers of the grape and foodies flock to Margaret River, world-class wineries and cellar doors offer sensational wines, exquisite eateries serve up local lobster and organic beef, farmers markets tempt with cheeses, chocolate and delicious preserves, walk remote white sand beaches, swim with dolphins and spot migrating whales along the dramatic coastline. Depart this morning for a winery, gallery and brewery tour. Enjoy personalized tastings of wine, beer, coffee, cheese olive oil and chocolate. Have lunch at Cowaramup Brewery and enjoy a complimentary crafted brew or local wine. Breakfast, Luxury Coach Tour with Hotel Pick Up, Beer, Wine and Cheese Tastings, Special Brewery Lunch, Overnight Margaret River Accommodation. Depart Margaret River and explore Mammoth Cave. Take in the Boranup Forest and browse through the Boranup Gallery. Pass through Augusta before visiting Cape Leeuwin Lighthouse, the tallest lighthouse on mainland Australia. Stop for lunch in Augusta before heading back to Margaret River to enjoy some free time. Farewell Margaret River and make your way back to Perth. Breakfast, Luxury Coach Tour with Hotel Pick Up, Café Lunch, Overnight Perth Accommodation. Just 19 km off the coast of Perth, Rottnest Island is a pristine paradise, spot for quokkas and amazing birdlife, take one of the many bike and walk trails through scenic surrounds, climb the Wadjemup Lighthouse for sensational views and swim, snorkel, surf, dive and fish the crystal clear waters keeping an eye out for friendly dolphins. Breakfast, Return Ferry, Luxury Coach Tour with Hotel Pick Up, Overnight Perth Accommodation. The Indian Pacific to Perth All-Inclusive with Margaret River Stay <br> is very popular. Many dates book out well in advance, please book soon.